Over time, vehicles may leave all sorts of oil stains and the like on your commercial concrete and asphalt. You’ll want to get those stains removed ASAP, as they are not only unsightly but also unsafe. 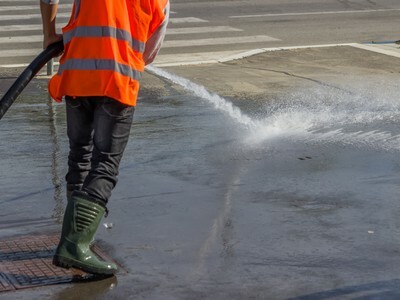 Fortunately, you can get those stains removed in no time by calling the New Jersey pressure washing pros at AAA Pressure Wash.
Our experienced team will get your commercial concrete and asphalt looking clean and new in little time thanks to our oil stain removal services. As quickly as we promise to work, though, we will never sacrifice quality for speed. So, you can be sure to enjoy the highest-quality commercial cleaning services by calling on our pressure washing company. These problems can lead to many problems for your New Jersey business – problems which could even lead to its closing down. Fortunately, you can avoid these problems by giving us a call. With a thorough concrete and asphalt oil stain removal, we’ll remove this potential for people to become harmed on your commercial property. Of course, maintaining a successful business requires more than just keeping the place safe. It also requires maintaining stunning appearances. After all, a beautiful business will help to attract customers while also ensuring that employees are motivated and in good spirits. By removing unsightly stains and unwanted graffiti from your commercial property, you can ensure that your New Jersey business will look its very best. You can further keep your business looking great with routine building washing services, which we offer on a monthly, quarterly, and yearly basis. If you are looking for a Concrete and Asphalt Oil Stain Removal service in the Northern New Jersey area, please call us today at 888 – 857 – 5441 or complete our online request form.